Late Friday, I got word that the next big Food Experiment had been scheduled, and I am PSYCHED for it. Beer and cheese, these are a few of my favorite things! 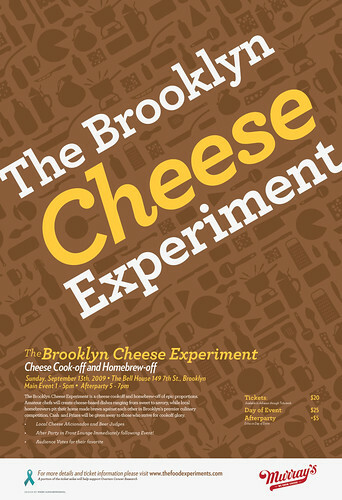 Sunday, September 13th at 1pm sharp, the Brooklyn Cheese Experiment will be going down at The Bell House in Gowanus. The judges already include Taylor Cocalis-the Director of Education at (one of the best places in the world) Murray's Cheese, Andrew Knowlton-Restaurant Editor at Bon Appétit Magazine and an Iron Chef Judge, and the Brewers from Sixpoint Craft Ales. As with the Brooklyn Beer Experiment, there will be the food section as well as a homebrew section, winners need to be decided in both. I know I can't miss an afternoon of beer and cheese. If you think your homebrew or cheese-based masterpiece needs to be shared with the world, go here for the entry form. Chances are the spots will fill up soon! Or if you're like me and want to just enjoy the afternoon surrounded by beer and cheese, click here for tickets. They're $20 online, $25 at the door. Special $5 after-party tickets will be sold at the event. For more info, feel free to visit Theo and Nick's site, thefoodexperiments.com.